The kick-off meeting took place between 4th and 6th of October 2010 in Leipzig, Germany. 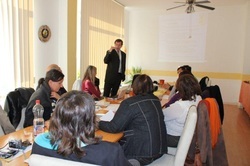 The three day project meeting included upon others different study visits in creative workshops in the city of Leipzig. Within the first day of the meeting the European project partners got the opportunity to visit the Keramikwerstatt andrea doria e.V. which are offering different ceramic workshops for children and adults, as RAKU-workshop - a special burning technique originating from Japan or workshops offered for laymen to experimentalise with clay and glaze. Afterwards, Ms. Siegrid Müller, the owner of the online shop “Stoffkreationen” was invited to the meeting to talk about her challenges and experiences by creating her small online shop. As a success story she mentioned the endless possibilities of online shops to reach people from all over the world as she even has regular customers from Japan or Finland. Mr. Wennemar de Weldige from the City of Leipzig, Department of business development informed the participants of the kick-off meeting about requirements for set-ups of micro-businesses as well as about possible grants. Sister Gudrun from Naomi e.V. welcomed the YOCAIT project partners on the second day of the meeting in “Kreativstube” (creative room). Naomi e.V. offers creative courses for disadvantaged women. The aim is to support their social integration in the society, to engage them to work creatively and to foster them to use their time meaningful.The European project participants attend a crative course about working with whool and practiced different felting techniques. 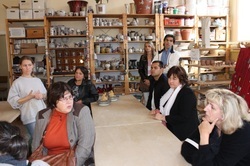 On the last day of the meeting, the partners visited the Werkstatt des Lichts, a small shop, making candles, to get to know more about set up of smallbusinesses in the field of handcraft. Mr. Wolf operates also an additional online-shop where interested people canbuy different kinds of candles. More detailed information about local partners under the menü bar "Local Partners". Further information about the meeting are available in the report here.